"… As the evening twilight fades away, the sky is filled with stars invisible by day" are the immortal words of Henry Wadsworth Longfellow. Alas! this does not hold ground for many people in countries of Asia Pacific (and maybe elsewhere too). The elderly are getting pushed more into a dark night devoid of stars. The erosion of traditional livelihoods and family support, along with weak health systems, is simply increasing their vulnerability. Old age means different things to different people. The quality of the sunset years is influenced by factors like economic security, social support, literacy, gender and one's own mindset and thinking. While, as the modern saying goes, life might be beginning at 60-65 for some, for many it starts fading painfully at this juncture. Mrs Mac Thi Mua, is one such elderly people who lives in Luu Ha village in Kinh Mon district of Hai Duong Province, Vietnam. I met her in her modest two-roomed house and was instantly struck by her beauty. The wrinkles on her 88 years old face and her indigent situation had failed to wipe the twinkle in her eyes. Seated on a mosquito-net fitted bed with a wheel chair kept close by, her sad but lovely demeanour spoke a thousand words. "Son lost to lung cancer..."
Mua lost her son in 2006 to lung cancer. Her two married daughters live far away and are not in a position to take care of her. Mua was doomed to live alone, with her failing health and abject penury, in her twilight years. To top it all, last year she broke her femur bone due to a fall and has since been almost immobile - confined to her bed and to her wheel chair. But three years ago, a stroke of luck brought her in contact with an Intergenerational Self-Help Club (ISHC) operating in her district. Since then, her life changed for the better. While her own kin have left her, two volunteers (Nguyen Thi Phong and Vu Thu Thu) of the club, living in her neighbourhood, have taken it upon themselves to fill her dark night with some stars. These two volunteers have enough work on their hands of tending to their paddy fields. Yet they manage to find time to look after the old lady. Every day they bring milk and cooked meals for her; feed her; bathe her and clean the house - it was spick and span. Earlier, they would visit her once a week, to help her with her weekly chores. But since her fall, one or the other is with her for almost the entire day. They take turns to stay with her at night. Mua cannot go out but can move around inside the house when put on the wheel chair. She has no income of her own. The volunteers take care of her food. Some money has been collected by the club members to support her. 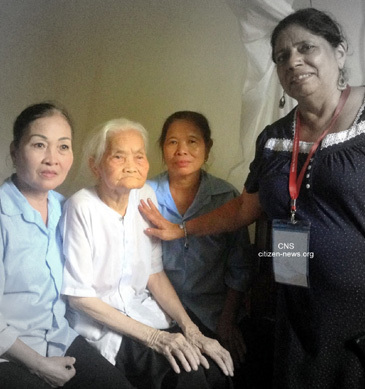 The nurse from community healthcare facility comes to her house for the monthly checkups. Her eyesight is failing and her hearing is impaired. But her mental faculties are very alert and her spirits are high. She thanked us for coming to visit her and apologised for not being able to entertain us as her guests. Mua’s situation aptly describes the Vietnamese saying that neighbours help when families fail to do so. This is just one of the many success stories of the ISHCs which are sustainable, self-managed, and multifunctional organisations aiming to enhance equitable and inclusive development. They are an innovative and sustainable community approach to help improve the lives of the elderly Vietnamese, their families and communities and enable the poor and disadvantaged people to lead a dignified, active, healthy and secure life. During the recent 2016 HelpAge Asia-Pacific Regional Conference on the Economic Implications of Ageing, held in Hanoi, I had the opportunity of attending a monthly meeting of one such ISHC at Luu Ha village in Kinh Mon district of Hai Duong Province. This particular ISHC was founded in June 2013. The club has eight core areas of activities including health, home care, income generating activities, rights and entitlements, awareness raising on a wide variety of topics, self-help activities, fund raising, and cultural performances. It currently has 53 members, most of whom are in the age group of 55-65 years, with the eldest being 72 years old and youngest below 55 years. It is mandatory for each club to have 70% women members and 30% male members. Also 70% members are more than 55 years and 30% less than 55 years of age. The club is not just for older people but it is intergenerational and is also for this who will become old in the next few years. All members live close by in the same community. Membership fee is 5000 VND/month (approximately US cents 25). For the 1st two years a monthly project support of 250,000 VND/per month is provided. But after that the club has to support itself through its fund raising activities. Club members actively participate in club activities like monthly meetings, sanitation drives, and cultural and physical activities. Structured club meetings, around a very specific agenda, are held preferably on a weekend around the 15th of every month, and last not more than 2 hours. I was fortunate to witness their group exercise (Tai Chi), followed by a cultural programme. Then leaders of each of the 4 groups presented their monthly report. Next was a discussion on family violence wherein all members gave their inputs. Every month the club chooses some relevant topic for discussion to help raise awareness of the members on various issues and also help in instilling good living practices in them. Community members are also involved in club activities like voluntary home based care, economic development and local sanitation drives. Main activities include bi-annual healthcare check up of its members, cultural performance by a group of members on all meeting days as well as in neighbouring villages; home care support for 5 community members through 5 volunteers; self help/ community support activity - weekly cleaning drives, biannual cleaning of ditches, helping older people, who are living alone, in sowing and reaping rice/ paddy fields, killing rats; awareness raising on rights and entitlements, and income generating activity. Currently there are 1,000 ISHCs with 55,000 members, operating across 17 provinces of Vietnam. Recently Vietnam government has officially approved the plan to replicate the ISHC model and have 3,200 additional ISHCs in 65 provinces. Eduardo Klien, East Asia/Pacific Regional Director of the HelpAge International, rightly believes that ISHCs model is one of the best, most reliable, durable and participative community-based models. Hopefully, this great innovative model for grassroots development will be shared and replicated by other countries in Asia and the Pacific, including India, to help those senior citizens who are in urgent need of dignified care.